These Oven Baked Hash Browns are delicious rounds of crispy shredded potato and although usually deep fried, we have oven baked these homemade hash browns to keep them lighter. They are still just a crispy, but you are saving a few calories. I love hash browns! The only problem with hash browns is that they are usually fried when you order them in a restaurant and they are overly greasy and therefore not enjoyable. They don’t have to be fried and they taste just as good baked in the oven. They still get the same crispiness that comes from frying them, but without all the oil. So, you get to have an indulgent weekend breakfast that isn’t really that indulgent. 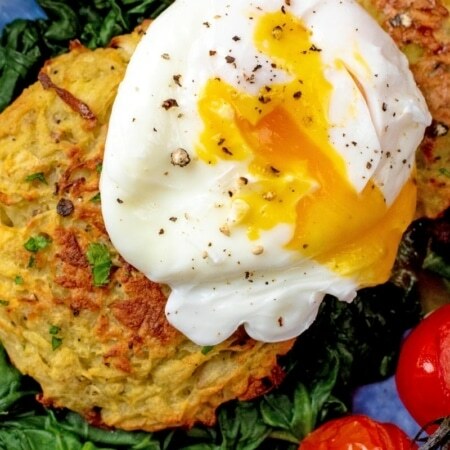 You can even make these hash browns slimming world friendly. 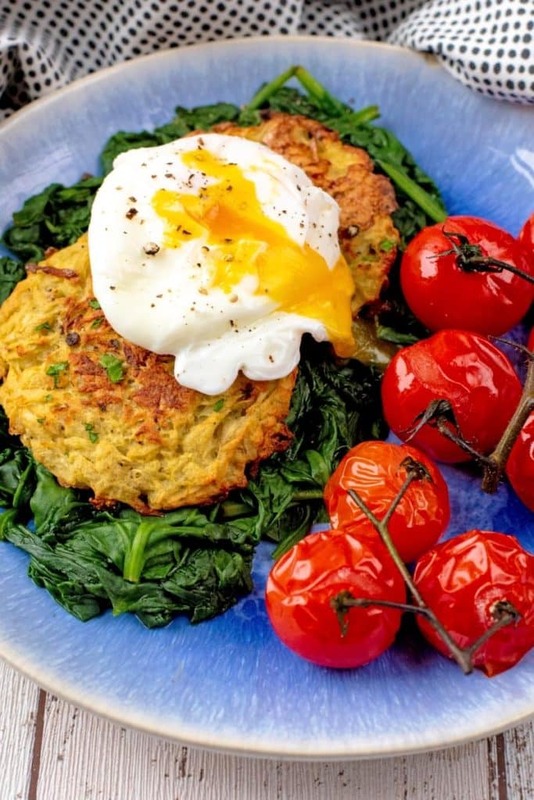 Just be mindful of portion sizes and if you are going to fry them at the end to make them extra crispy, then do them in spray oil to keep this hash brown recipe slimming world friendly. Although these hash browns take a bit longer to prepare than say throwing some cereal in to a bowl, that doesn’t mean they are complicated. Once you have mixed the shredded potato with all the other ingredients and shaped them, they are in the oven and you don’t have to worry about them. You are free to enjoy your morning. Unlike frying where you would have to watch them all the time. You can also add different flavours to them if you like. We just added a little garlic, salt and pepper, but you could add Mexican or Italian seasoning for a change. What Potatoes To Use For a Hash Brown Recipe? I usually go for wavy potatoes like Maris Pipers and Jersey Royals, as they tend to hold their shape better. 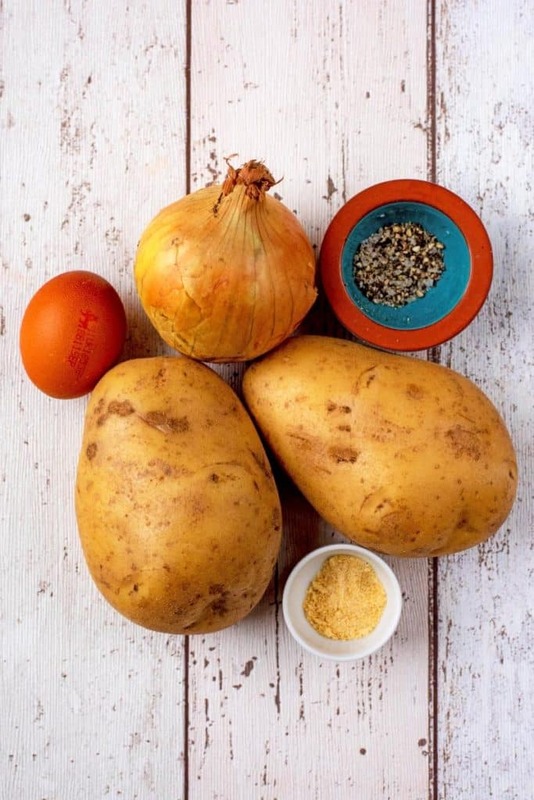 However, if you want a super crispy hash brown, then go for a starchy potato like russets – they might fall apart, but what is stuck together will be nice and crispy. It really comes down to personal preference. Can You Freeze Hash Browns? These are perfect for freezing! Because they take a little longer than the average breakfast to make, batch cook them and then freeze then in individual portions for a quick weekday breakfast. 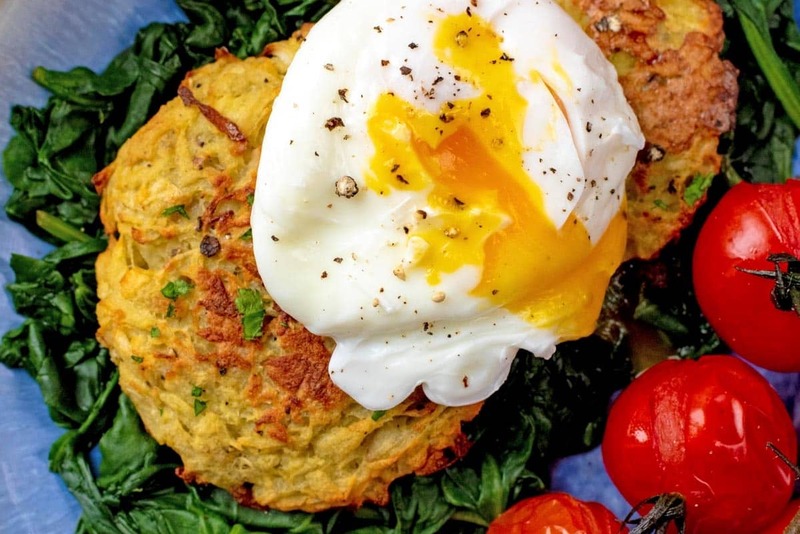 Hash browns don’t just have to be for the weekend! Once the hash browns have cooled down, you can either wrap them individually or you can stack them with baking paper in between each one and then put them in a freezer bag. Simply take one out of the freezer as and when you need one and defrost fully before reheating. One: Grate the potato and onion on the large side of a box grater. Two: Put the grated potato and onion at the centre of a kitchen towel and squeeze out the excess liquid. Three: Put the mixture into a bowl and add the egg and a little salt and pepper and garlic and combine. Four: Lightly grease a baking tray and get handfuls of the mixture and shape in to circles. Put them on the tray and gently flatten – the mixture should make 8 hash browns. Five: Bake at 200°C/400°F for 15 minutes. Flip them over, pat them down and then cook for a further 20 minutes until they are crispy. 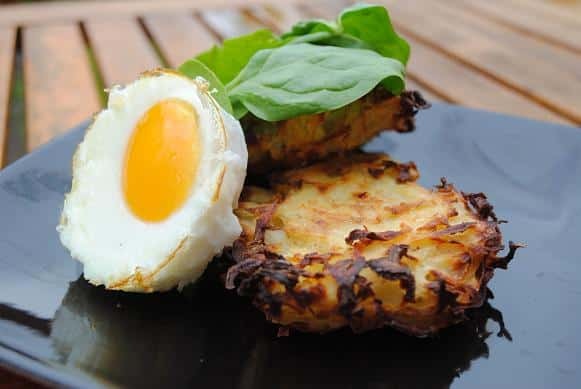 You can add loads of different flavours to these hash browns. Give them a Mexican twist by adding Mexican seasoning. Give them a Spanish twist by mixing in some smoked paprika. You can eat these hash browns for breakfast with eggs on top or have them as a side dish. Try making them with sweet potatoes – cooking time may vary and they won’t get quite as crispy, but it makes a nice change. Do you want to be kept up to date on more delicious posts like these Oven Baked Hash Browns? Please subscribe to the blog mailing list (it takes 30 seconds). 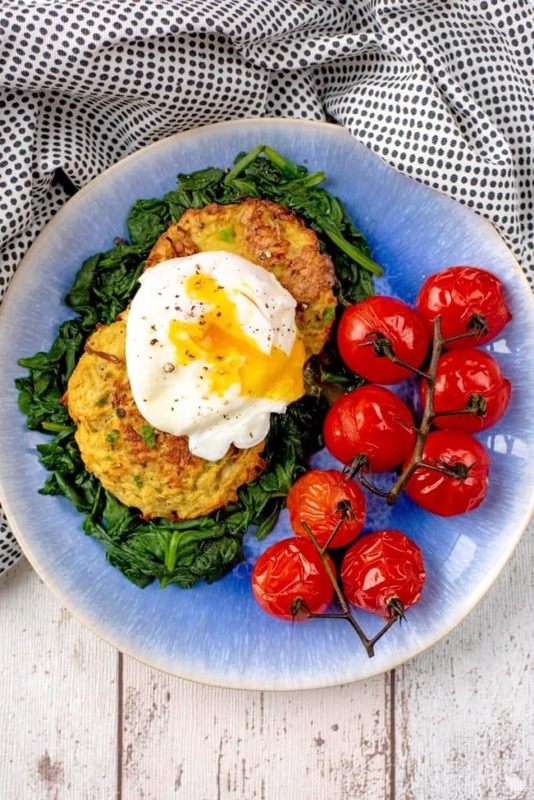 If you’ve tried these Oven Baked Hash Browns, or any other recipe on the blog, then let us know how you got on in the comments below, we love hearing from you! You can also FOLLOW US on FACEBOOK, TWITTER, INSTAGRAM and PINTEREST to see more delicious recipe ideas, behind the scenes shots and also what we are getting up to. These Oven Baked Hash Browns are delicious pieces of crispy shredded potato and are not an everyday breakfast item, but one we like to enjoy at the weekends or when I have a big day ahead. Grate the potato and onion on the large side of a box grater. Put the grated potato and onion at the centre of a kitchen towel and squeeze out the excess liquid. Put the mixture into a bowl and add the egg and a little salt and pepper and combine. 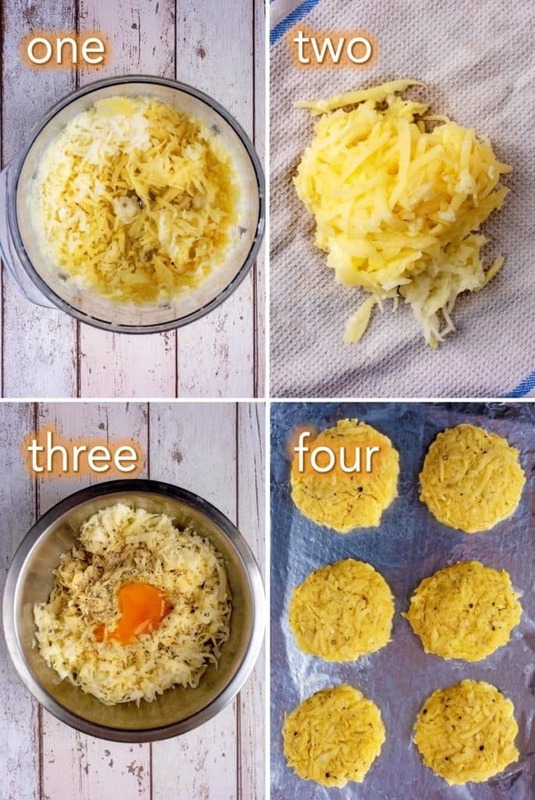 Lightly grease a baking tray and spoon the hash brown mixture onto the tray into 4 circular rounds. Bake at 200°C/400°F for 15 minutes. Flip them over, pat them down and then cook for a further 15 minutes until they are crispy. Serve with topping of your choice. Try making them with sweet potatoes - cooking time may vary and they won't get quite as crispy, but it makes a nice change. 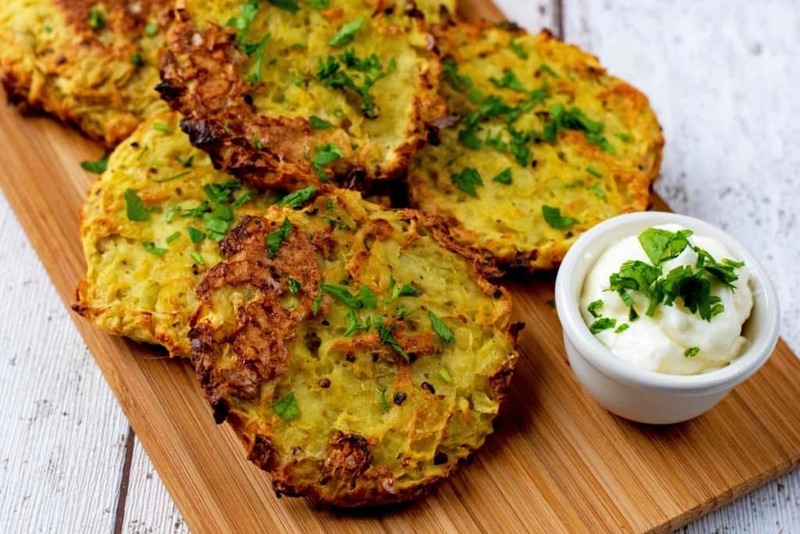 I love hash browns – excellent idea to bake them! I would love more healthy breakfast recipes if you have them? I was never a fan of ‘traditional’ hash browns. I just hated the texture and taste. And they were always so greasy. I imagine a sweet potato hash brown like this would also be awesome. 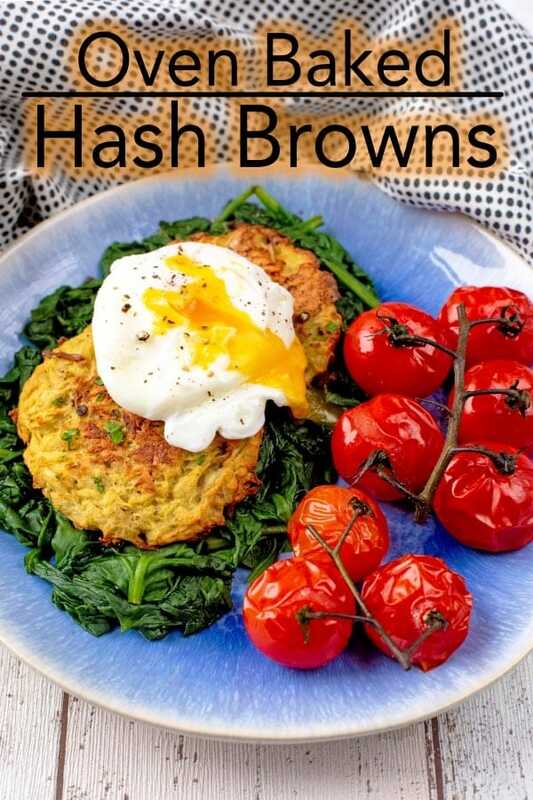 Loving your work, these look awesome, I love hash browns, guess what the family with be having tonight. I am doing the little changes each week along with you, each time you post one. I must say that I am noticing such a difference. I didn’t think that making such small changes would make a difference, but like you always say, it all adds up. I can’t wait to make these. We always go out for breakfast at the weekend and we always order a side of hash browns. This year we need to cut back on eating out at the weekend as we are focusing on our health, so making these will make that a little easier. Thanks! 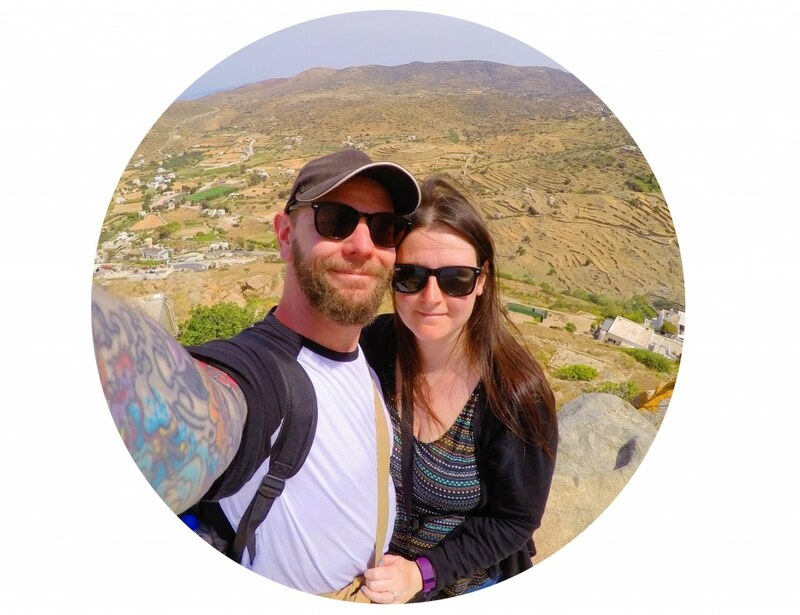 Love your blog, and your facebook page! Found you through weight watchers uk facebook page, and tbh i look at yours more than that now! :p you focus on good HEALTHY food, not just what has the lowest points! And your chocolate dessert recipe, is becoming a favourite, ive made it twice for me and my husband now 🙂 thats a lot for me, usually i look at summat, think yea id like that but never actually make it! But your recipes are so wonderful they make me want to get in the kitchen! Thanks Lyndsey, that is so nice of you. The chocolate dessert is one of my favourites too. I haven’t made it in a while, so thanks for the reminder. I am excited to make these! I love the idea of baking them instead of frying. I just saw this posted on your Facebook page. Mmmmmmmmm – it looks lovely. Not sure I could spend an hour making it during the week though. One for the weekend. The hash browns look great too. I have a whole folder in my bookmarks of just your recipes that I want to try! I found your blog through Fitness Magazine and I am so glad. I have only been reading your blog for around a week but it is my favourite one. So many people just post about eating nothing but salad and only drinking water, but you actually make nice food. You have the best recipes. I always try to make the time to make things myself, rather than buy them ready made, but I must admit that hash browns is not one of them. After seeing this recipe, I will be making them myself. I am trying to make more of my own food rather than just buying it frozen. I will try to make these. I LOVE hash browns. I didn’t think they would stay together if I cooked them in the oven, so I have always fried them. Thank you so much for this recipe, I am going to make it right away. My husband is going to be stoked when he comes home to hash browns tonight. I will tell him to thank you!